Yesterday, I was wandering around the interwebs, and for some reason, I ended up listening to an old MTV Unplugged show featuring Alice In Chains. They used to be played on the radio all the time, when I was still listening to the radio, instead of listening online, and I remember well, singing along with “Rooster” and “Down In a Hole” and other songs I don’t know the name of. I can completely relate. The songs really speak to me, especially on days like yesterday. It really felt like I was down in a hole, and that everything was conspiring against me. Those songs especially remind me of how intensely I used to relate to them about 10 years ago, and that old feeling is familiar and comforting. I realize just how far I’ve come in my recovery. Those songs used to mean so much to me… but now they’re more important to me as intermittent reminders, occasional reassurances. Something to keep me balanced and reminded that life has its ups and downs, and continues on, nonetheless. I don’t think I’m going to go back to listening to Alice In Chains on a regular basis. I start to feel a little depressed, when I do that. But it’s good to remember, they’re still there. And I can tune in to listen to them, anytime I need that. I just read about the WBUR Poll: For Head Injuries, Football Fans Support Regulation, But Haven’t Changed Viewing Habits, and it got me thinking. I’m a big football fan. Even though I don’t watch every single game, I still love the sport. I also love to watch boxing and MMA. Even though I know what it’s doing to the contestants — potentially causing brain injuries that will screw them up, sooner or later — I still love to watch the sports. There’s something about seeing people wade into a fight and then come out on the other side (victorious or not) that’s very cathartic for me. I think that’s because it reminds me of my life. I feel, on any given day, like I’m wading into a fracas of some kind. Either it’s work, or it’s just the everyday occurrences, or it’s dealing with the slings and arrows of the world. But whatever the nature of it, I feel like I’m getting beaten up… like another “team” is gunning for me… and like the players and fighters I love to watch, I have to keep my act together and keep going, till the end of “regulation play”. I think that I’m not alone in this. A lot of people I know feel constantly attacked by life. We know we’re gonna get roughed up. That’s a given. We know it’s gonna hurt. We know we’re going to get pushed and pulled and trampled in the process, but we have to keep going. Like the players on the field. And like those players, we take a calculated risk, every time we engage with life. We know the odds may be stacked against us, but we still keep at it. We stay in the game. And like so many of those players and fighters, even when we should probably sit out to let our brains recover, we head right back in there, as soon as we can. Because that’s the only way we know how to be, how to act, how to get along in life. Personally, I cringe, when I think what’s being done to the “heroes” on the field and in the ring. I know what’s being done to their brains. But life is rough. It’s tough. It beats you down and knocks the stuffing out of you, time and time again. Football players and fighters are like our proxies. We fight to live, they live to fight. And just about everybody can relate to that. What I do, is What I am… and is Who I am. This past weekend was a busy one. It was busier than I expected, because a project I’ve been working on had a “pre-launch” on Saturday, and I had to join a conference call for a few hours, starting at 8:00… and then I was on-call for the rest of the day. I also had errands to run, in advance of next week’s Thanksgiving vacation (which actually won’t be much of a vacation, because there will be so much travel, family stuff, and tiring activity). It’ll be good to be away from work, but the change in schedule brings its own stresses. But all in all, things are good. I know that, even though it’s going to be challenging, I have the tools and the skills and the capacity to handle whatever comes my way. This is a huge change from before. Monumental. And the fact that my last nasty concussion was at Thanksgiving in 2004 (13 years ago), always brings up the reminders of how my life was turned upside-down, starting around this time of year. I’m managing all the different things I have to “juggle”. Getting errands done in advance. Doing up-front planning for when to travel and what to do along the way to keep from being destroyed by hours and hours in the car. Regular stops are called for. Stretching and exercises by both myself and my spouse. Taking our time, so we don’t suffer too intensely from the whole trip. I’m actually pretty concerned about the physical effect this trip will have on us. We’re both in king of rough shape, physically. My spouse more than me. And it’s tough, because they’re not very active, to begin with, and that makes it harder for them to recover. Plus, the reactions of our families, when they see just how limited they are with their mobility. People can be both insensitive and cruel and alarmist. What’s needed, most of all, is for people to be strong and positive and supportive. Not despair and think all is lost from what really could be a temporary condition. I’ve been thinking a lot about how I managed to put my life back together… how I managed to restore my Sense-of-Self. I had a lot of help from someone who talked sense into me each week. But I think even more than that, what brought me back was effort and action — consistent effort and action. Taking action and then giving a lot of thought to the results… and then taking more action… that’s done wonders for restoring my sense of who I am, and getting me on solid ground again. The thing about TBI is that it takes away your sense of who you are — that unconscious, instinctive trust in yourself. And when that goes away, it makes life that much more stressful. Which means that you don’t learn as well as you could under less stressful conditions. And that means your recovery gets delayed. I know mine did. For years. Because I didn’t recognize myself. I didn’t know who I was anymore. And I became unrecognizable to the people who used to be my friends. But as I just got on with my life (kicking and screaming, the whole way), and I worked through one situation after another, I came to recognize myself again. Through repetition. Through keeping to a schedule. Through regulating myself with checklists and strategies that made repeat experiences possible and re-taught me to recognize myself. I think rehab people vastly under-estimate the impact of that loss. And as a consequence, they (and we) lose valuable ground, without realizing it. Without ever understanding why. After TBI, you have to re-discover who you are. People do that in different ways. For me, it came through action. Taking action. Again and again. And soldiering through the failures and frustrations to build up a better understanding of who I was, what I was about, and why things mattered to me. Action, in addition to thought, brought me back. But sometimes we get it backwards. I know I did, for years, up until the post-TBI symptoms were so bad, my life was about to implode. People still do it. All the time. I was talking with a friend yesterday who’s been having a lot of trouble getting their life together. They said they wanted to understand the underlying nature of their confusion and lack of direction, in order to go in the right direction. I suggested that rather than trying to figure out the mental background of it, they simply move forward, take action, and do the things they want to do. If they wait around to understand what’s going on, they may never get started making the concrete, substantive changes they need to make, to get their life in order. They’re in a state of “analysis paralysis”, in any case, so just about anything they do to move forward will be step in the right direction. I’m not sure if that sank in with them, or even if it made any sense. But they seemed to get it. And I hope they can take the steps they need to take. Anyway, that’s on them. I have my own life to worry about. But I’m too busy doing things to worry much, these days. Author brokenbrilliantPosted on November 13, 2017 November 13, 2017 Categories Personal Experiences with TBITags Brain Injury, brain injury recovery, concussion, danger, danger-seeking, head injury, injury, Mild Traumatic Brain Injury, mtbi, recovery, risk, risk-taking behavior, sports, sports injury, tbi, traumatic brain injuryLeave a comment on What I do, is What I am… and is Who I am. To be honest, I haven’t been following the NFL litigation that closely. It all gets to be too much to keep track of. But this is a great summary of what’s going on, and how it may impact the NFL, as well as the rest of the country. The Year of Football Lawsuits just took its next and possibly biggest step of all. A New York Court has sided with the NFL’s Insurance Companies and ordered the league to do what noone has managed to do before. Some background for those unaware. Not only has the National Football League fought admitting anything and only rushed to settle the Ex-Players Lawsuit when it appeared it would have to open its drawers, files, closets, secret compartments and anyplace else they have documents on what it knew and when it knew it about the risks of Concussions for Players, it never wanted to pay for anything. The NFL wanted its Insurers to pay it for them and the Insurance Companies said Hell no. The NFL sued. The Insurance Companies sued right back. Those Lawsuits have been slow rolling as the Settlement of the Players Suit was moving along. Now the Judge in the Insurance Companies Suit against the NFL has said it’s time to find out what this has all been about. Maybe there’s a principle at stake here. But probably not. It’s probably all about the Ex-Players Settlement Money. UNLESS…and it’s the biggest unless in the history of Sports in the United States. Unless those Insurance Companies are also looking at all of their other Customers who are being sued, will continue to be sued and will be sued alot more for alot more money over Football and Concussions/CTE. Customers like Cities, States, Universities, Pop Warner and a whole lot of others. Maybe even including Television Networks and Football Sponsors. If those Insurance Companies are thinking about them, they might have only one thing in mind right now. Finding out if and how badly the NFL, its Owners, Commissioners, Executives, Lawyers, Doctors, Public Relations Firms and anyone else around them screwed the Country. … how badly the NFL, its Owners, Commissioners, Executives, Lawyers, Doctors, Public Relations Firms and anyone else around them screwed the Country. Not just the players, not just their families (although that’s reason enough to go ballistic on the NFL), but the Country. If the NFL opens its books and shows its hand — and we actually let it sink in, what a fraud and a disgracefully dangerous, soul-sucking, life-killing scam the NFL has perpetrated on this country, all for the sake of “entertainment” — some very rich people are going to have some explaining to do. Think about it — the marketing of the NFL, their propagation of playing practices and enthusiasm for football, their large-scale investment in cultural shifts towards idealizing the game they make billions from… as well as the whole infrastructure of pee-wee football –> high school –> college ball –> NFL (which has been described as an “underground railroad” for poor African-American kids to break the cycle of poverty)… we’ve all been marinating in football fever for as long as I’ve been alive. The started the Super Bowl around the time I was born, and I grew up — like so many others — really steeped in that head-banging excitement, which was never, ever questioned or challenged. Football was never considered as dangerous as it truly is — and that’s for a very good reason. The folks who stand to gain ma$$ive amount$ of money have paid well to keep that information out of the public eye and discussion. But now it’s coming around, and we’re going to have to take a look at just what the cultural thought-control by these ve$ted interests hath wrought. And yes, they are going to have some explaining to do. Between the Panama Papers and these lawsuits, as well as the anti-elite dust storms kicked up in this election year, it seems to be a theme. I just wish it didn’t cost us so much, to get a clue. New research suggests head impacts from a single football season can result in brain changes in high school varsity players. That surprised me. So, I looked it up. Sure enough, there it was in black-and-white. Here, I was talking about concussions as a collection of symptoms and issues, slowed processing speed, emotional lability, or sensory hypersensitivity. And I was hearing a lot of other people talking about concussions in precisely those terms. I (and everyone else) was using it interchangeably with “mild traumatic brain injury” or “head injury”. But the meaning of the word “Concussion” doesn’t have anything to do with the brain injury itself. It actually has to do with the action which causes the brain injury — the shaking of the brain, as well as how it dashes against the inside of the skull. Like the word “percussion” – from the Latin percussio(n-), from the verb percutere ‘to strike forcibly’. So, the word “concussion” is NOT about the injury itself. It’s actually about the source or cause of the injury. It’s about the action of the brain and skull which produces the injury, not the injury itself. “Concussion” was closer in meaning to the word “collision”, than it was to “brain injury”. So, to be totally clear, Concussion is the actual event of having your brain shaken and/or dashed against the inside of your skull. The proper term for what you get as a result of that, is Traumatic Brain Injury. It’s intimidating, yes. It’s scary, yes. Considering what a “black box” the brain is to most people, including plenty of General Practitioner docs, labeling an injury as “a brain thing” elevates it to a mysterious niveau shrouded in secrecy and confusion. Unfortunately, it happens to often, that giving into the intimidation and steering clear of “that brain stuff” is about the worst thing you can do. You’ve got to talk about the brain. You’ve got to talk about the injury as what it is — a neurological issue, which may or may not clear up in the space of a few weeks. When talking about Concussion treatment, I think this point is absolutely critical. We can’t afford to keep mixing up our terminology. A doctor doesn’t treat a car accident. They treat the injuries after a car accident. You don’t recover from a collision. You recover from the injuries you received from that collision. A doctor doesn’t treat a fall. They treat the contusions, sprains, and other trauma from the fall. When a doctor treats a “Concussion”, he/she is treating a brain injury. Not the impact itself. Steering clear of calling a thing what it really is, makes it very difficult to understand and treat. As for the Concussion itself, once the impact was over and the brain stopped being shaken and dashed against the skull, the Concussion stopped. The injured individual subsequently acquired a brain injury. Impact and effect. Two different things. When you’re talking about concussion prevention, you’re talking about preventing the action of the brain and skull and neck (and perhaps the whole body) which produces a brain injury. By association, you’re going to be mitigating at least some risk of brain injury — often addressed with protective gear and different techniques of play/tackling. But you’re not going to 100% eliminate the threat of brain injury, by preventing conditions that produce concussion. Due to the force (mass x linear acceleration) of the moving body, there is only so much that a helmet or a different technique will do to reduce the force of the brain inside the skull. Two players moving fast can still collide with the force of an automobile accident, helmets or no. And the brain, sitting in its somewhat protective envelope of fluids, is going to move. It is not staying put. When we interchange the terms “concussion” and”brain injury”, we’re really talking about is two different things — cause and effect… action and result… connected and interrelated… but not identical. Nor interchangeable. We confuse the two, and in the process, we fail to identify the actual problems that need to be fixed. We fail to understand the nature of them. We fail to adequately assess the impacts of them. And we certainly can’t fix them. What’s more, we’ve got folks on all sides of the issue “stepping on each others’ toes” because they are all claiming to do the same thing — prevent and treat concussions — when they would more effectively divide their activities between preventing concussions and treating the resulting brain injury. Professionals, academics, policy-makers, product designers, manufacturers, and everyday people who are campaigning against concussion, are mixing their terminology, conflicting with each others’ agendas, getting pissed off at each other, and failing to unite around a common cause… all because there’s not a clear distinction about what we’re actually dealing with — for real. First, I think our definitions of Concussion and mTBI could use some refinement. Ideally, we’d have a comprehensive term to “wrap around” the end-to-end phenomenon. Since there are multiple stages in the development of a TBI after concussion, it may not be realistic to have one catch-all term. However, what we now call “Concussion” might be more accurately termed “Concussive Brain Injury” — CBI, for convenience. Second, we need to “chunk out” the issues that are specific to each phase of CBI, to address each specifically and effectively. The realm of Concussion prevention is the First Line of Defense. However, it’s never going to be 100% guaranteed. Focusing intently on Concussion prevention, as though it is a potentially fail-safe approach (it’s not, and it never will be), actually sets us up for reduced access to the help we really need. For when that First Line “fails” to protect, there’s a “Zone of Dismay” you need to pass through, in order to effectively treat the TBI that results. The First Line defenders have to admit that their approaches weren’t fail-safe, the folks who were 100% behind that First Line of Concussion Defense have been let down — and confusion, frustration, and an inevitable sense of betrayal ensues. It’s this Zone of Dismay, I believe, that often blocks injured individuals from getting the help they need. What First Line defender would ever want to admit that their approaches are limited? And what individual(s) who placed their faith in them, wants to be let down? But clearly, when there’s an injury, brain injury treatment needs to be pursued. Here’s where the diagnosis and treatment come in. And the monitoring after the treatment ensues. You have to understand how things are going, if they’re working, if they’re not… and address and adjust accordingly. There needs to be clear communication between the two sides, so that they can most effectively address their own individual piece of the puzzle. CBI prevention and treatment cannot possibly be done properly in isolation. You need a team approach, a team effort. Brain injuries change over time. They present differently from person to person. So, whether it’s open communication between helmet manufacturers and coaches/teams/school districts… free flow of diagnostic information to determine Return To Play/Learn/Work… continued communication between patient and healthcare providers… or any other parties involved in the situation… the more quality information gets passed along, the better the chances of a positive outcome. Fourth, everybody needs to quit playing around and get real about Concussion and Brain Injury. Players, coaches, parents, teachers, employees, employers, peers, superiors, collaborators, providers, consumers… everybody needs to get a clue about what the true nature of this type of injury is. People need to learn about the symptoms, the effects, the impact, and just how widespread it is. Coaches need to admit if they’ve had a long history of head trauma, while playing their sport, and factor in their choices and behavior accordingly. Enough of the denial. Enough of the half-measures. Brain injury from concussion can be a lasting thing — and sometimes a deadly thing. If it doesn’t kill you right away, it can chip away at you, bit by bit, over the years, till you end up a shell. A homeless, institutionalized, imprisoned, or otherwise incapacitated shell. We as a society are grossly under-educated about not only the terrible outcomes possible, but also the potential for full recovery. There’s a common thread in cultural conversations about brain injury: that it changes you forever and you will never be the same after. It makes for big news and it catches people’s attention. But is it the whole story? No. But we don’t often hear the other side. This version of the story is, in my opinion, the biggest, most chilling factor in people’s fear of facing up to brain injury. There’s such a dismal prognosis, in general — thanks, in part, to the alarming findings of CTE in football players, young and old, and in the recorded incidence of TBI in the prison population. We as a society certainly don’t help the general populace face up to concussive brain injury. We scare the living sh*t out of them. Yes, it gets funding — a lot of funding. But at what cost? Fifth, everybody involved needs to discuss the facts with candor and courage. Many folks who have experienced concussive brain injuries are living full lives, many of them having recovered remarkably well, compared to their official prognosis. Moreover, millions of individuals have been clunked in the head, and kept on living their lives, regardless. Getting worst-case about it, just makes things harder. But information and realistic discussion about what’s what will go a long way towards making communication possible. Communication covers all quadrants — athletic, medical, employment, academic, domestic… And people need to have the right information. When someone’s got the wrong idea, others need to speak up — like when a CBI is making you miserable, but you keep getting pressured to get back to normal. You’ve got to speak up. And those who are looking out for brain-injured folks need to speak up, when they see them making poor decisions and going in the wrong direction. The truth helps – but you have to welcome and work with it. Sixth, we need to measure the results of what we’re doing. We need to track the steps we’re taking to see if they actually work. What works for some, will fail for others. But if you don’t measure it, you can’t manage it. We need some common measures for CBI severity, other than the Glasgow Coma Scale, which doesn’t help much with estimating the impact of a concussion. There are other ways to measure, and we need to find them. Again, this is going to take some coordination, and I haven’t the faintest idea how that’s going to happen. Nevertheless, I’m just going to put it out there, in case someone wants to take on that task. Seventh, real recovery takes continuous monitoring, and adjusting to beef up the strong points and minimize the screw-ups. Because we will screw up, now and then. It’s human. And we learn. We adjust. We need to make it permissible to err — and then learn in the process. People who are terrified of being proven wrong, or shown to be in deep error, don’t tend to be very forthcoming. So, we need to conceptualize our prevention and recovery approaches accordingly — leaving ourselves some wiggle room for lessons learned. Just as important, is tracking the stuff that goes right — and focusing on that. CBI can be a real b*tch, and recording the times when you’ve come out on top is very, very important — for you, and those who care about you. Lastly, it would be helpful to have uniform public policies in place that are based on facts, rather than fear. Nobody likes to get sued. Nobody wants a generation of young football players and cheerleaders, ice hockey stars, and soccer superstars set up for misery in life (sooner or later). Nobody likes to sit by and do nothing, while an epidemic rages. Policies are accordingly enacted, with states and municipalities putting protective measures in place. But are the policies always comprehensive and based on fact? It would be a miracle, if they were. Information about concussive brain injury changes and grows and shifts with each passing week, it seems. And guidelines are updated. How policies can be kept in line with the latest emerging findings (some of which may be important to consider ASAP)… that’s another conundrum. So, that’s my modest proposal. Distinguish between Concussion and Brain Injury, recognizing the two are different and distinct sides of the same coin, and they feed back into each other. Concussive Brain Injury (CBI) affects thousands upon thousands of people each year, and the ways we talk about the injury itself is impacting our ability to address it. The terminology is jumbled, confusing the event (Concussion) with the effect (Brain Injury), and that makes it difficult to discuss — and treat. Ultimately, I believe that “chunking out” the issues will not further complicate an already fragmented issue. I believe that it will enable the most appropriate resources and experts to focus on the specific aspects they are most qualified to address. Rather than spreading ourselves so thin across the conceptual landscape of the “Concussion Crisis”, we need to break down the elements, tackle them one by one, and piece together a more comprehensive and textured approach to what is clearly one of the most significant health issues of our day. But as long as we keep fighting over owning the whole territory, a comprehensive solution that will serve the wide range of concussively brain-injured individuals, will continue to elude us. Back in 2010, I discovered the work that University at Buffalo is doing on concussion recovery. It was very exciting, and it sowed some seeds of compelling thought in my racing brain… and those seeds are now starting to sprout again — spring is on the way, right? At the UB web page on concussion research, I found some interesting papers which talk about the difference between concussion and mild TBI. A recent review … of concussion and post concussion syndrome provided a model for distinguishing concussion from mild traumatic brain injury (mTBI) and post concussion syndrome (PCS). The model uses the most commonly accepted definition of mTBI and the one proposed by the American Congress of Rehabilitation Medicine and the Centers for Disease Control: loss of consciousness for no more than 30 minutes or amnesia as a result of a mechanical force to the head, and a Glasgow Coma Score (GCS) of 13 to 15 …. The model also uses the most commonly accepted definition of concussion as established by the American Academy of Neurology (AAN): a trauma induced alteration of mental status that may or may not involve loss of consciousness …. Although not explicitly stated in the AAN definition, concussion is generally viewed as a transient state from which the individual will recover fully in a relatively short period of time …. In contrast, mTBI is viewed as a permanent alteration of brain function even though the individual with mTBI may appear asymptomatic. Post concussion syndrome was defined in the Willer and Leddy … model as persistent symptoms of concussion past the period when the individual should have recovered (3 weeks) and therefore qualifies as mTBI. Neuropsychological testing is often used to describe the impairment associated with mTBI and PCS and have done so with relative success …. Originally, I found this information compelling, and it helped me make more sense of the whole “concussion thing”. I’ve sustained a number of blows to the head in the course of my life, and I have been diagnosed with “Late effect of intracranial injury.” But oddly, until my neuropsych referred to my head traumas as “concussions”, it literally never occurred to me that I’d sustained one (or 9). I can get pretty literal in my thinking, and because that word was never used in connection with my injuries, I never once thought of my mild TBIs as concussions. Now, over the course of the past years, I have repeatedly read that concussion and mild TBI are the same thing. And at first, it made sense to me. It was actually a relief, because for once, I could think and talk about my history of head trauma without implying that I was brain-damaged — which has a whole slew of problems attached. Brain damage doesn’t really get good press in the world I inhabit. Survivors are often portrayed as suicidal, homicidal, freakish, severely impaired, and/or the brunt of others’ ridicule, exploitation, or persecution. When many people think of brain injury, they think of brain damage. I did, too, until around 2010. Technically, I suppose there is a damage element to it it. But none of my friends, whom I’ve told about my mild TBIs, would believe that I had sustained that many blows to the head. I was just too functional. I was just too … normal… At least, as far as they could see. My personality and behavior just didn’t square with the kinds of functioning and behavior they expected from someone who’d been brain-injured. That’s what they told me. I just wasn’t “brain damaged enough”, I guess. Aside from other people’s ignorance and personal biases about this invisible injury, I’ve also had a hard time conceptualizing my mild TBIs as actual brain damage. I know that I have a number of physiological and logistical issues I need to navigate on a regular basis, and I know that my executive functioning is not what it could be. I know that my impulsiveness, poor planning practices, behavioral “irregularities”, and those danged emotional ups and downs are not typical for everyone around me. And while I’ve always struggled with those “irregularities”, I know my issues are a whole lot worse than before I fell in 2004. So does my spouse. But brain damaged? That term is so charged, and it brings up so many different images and impressions. It’s loaded with a not-so-great emotionally laden reaction, which I’m sure I share with others. Beyond the visceral response… outside my own head and in the wider world around me… when I looked around, I was very uncomfortable with the idea that everyone who has their consciousness altered after getting clunked on the head has an injury to their brain. According to concussiontreatment.com, “An estimated ten percent of all athletes participating in contact sports suffer a concussion each season”, but I found it hard to believe that 10% of all athletes who compete each season are walking around with brain damage.Think about it — with multiple sports seasons per year, and athletes rotating in and out of sports, that’s a hell of a lot of people getting dinged. And it’s not just athletes who get concussed. Plenty of other people fall down, too, or are in car accidents, or get beat up, or have things fall on their heads. Estimated hospital treatment of TBIs 2002-2006 – Note: There is no estimate for the number of people with non-fatal TBI seen outside of an emergency department or hospital or who receive no care at all. And the numbers have since increased — probably due to better data collection and more reporting by injured folks. As awareness grows, more people are inclined to treat their head injuries seriously and seek medical help. And medical providers are paying closer attention. In 2010, about 2.5 million emergency department (ED) visits, hospitalizations, or deaths were associated with TBI—either alone or in combination with other injuries—in the United States. TBI contributed to the deaths of more than 50,000 people. TBI was a diagnosis in more than 280,000 hospitalizations and 2.2 million ED visits. These consisted of TBI alone or TBI in combination with other injuries. Over the past decade (2001–2010), while rates of TBI-related ED visits increased by 70%, hospitalization rates only increased by 11% and death rates decreased by 7%. In 2009, an estimated 248,418 children (age 19 or younger) were treated in U.S. EDs for sports and recreation-related injuries that included a diagnosis of concussion or TBI. From 2001 to 2009, the rate of ED visits for sports and recreation-related injuries with a diagnosis of concussion or TBI, alone or in combination with other injuries, rose 57% among children (age 19 or younger). And the numbers keep changing, increasing each year as reporting gets better. Just in the past several years, the CDC changed the number of annually reported TBIs from 1.7 million to 2.4 million, I have no doubt the figures will continue to rise. Now, here’s the thing. If mild traumatic brain injury implies brain damage, then how come more people aren’t incapacitated? Thousands upon thousands of people sustain traumatic brain injuries each year, yet the general population doesn’t appear to be completely crippled by brain damage (though some people I know would debate that 😉 ) How is it possible, that so many people are injuring their brains, especially in their youth and/or in sports, yet so, so many are able to carry on as normal? That’s where UB’s distinguishing Concussion from TBI made sense to me. It removed the implication of brain damage from a head injury. It offloaded the spectre of debilitation from the mix, and it gave it a name that actually removed the inscrutable black-box brain from it, period. And that made it a lot less scary to deal with. At the time I read the UB paper in 2010, making the distinction between a concussion that is transient, and a head injury that’s a TBI made all the sense in the world to me. It made it possible distinguish between someone who’s experiencing irritating short-term issues, and someone who needs to deal with a broader-spectrum impact and a deeper set of challenges. And in doing so, the term concussion de-stigmatized the experience (at least in my mind). It steered my thinking away from the “concussion ==> brain damage” concept, which was intimidating and stymied my ability to think clearly about my injury. I’m sure I’m not the only person who feels this way. I would imagine the thought of being brain-damaged could be disheartening and even debilitating to a youth who has hit their head while playing a sport they love… or to the parents who love them dearly and are concerned for their safety and future. And if someone who got rear-ended at a stop light is branded as brain-injured/brain-damaged, what does that mean for their career and their ability to live fully as an adult? Calling a mild traumatic brain injury a “Concussion” solves a number of personal and social problems. It gives you permission to be injured for the time being, without making you permanently damaged. It gives you a word you can use with others without the immediate danger of being doomed to their eternal dismissal. There are tons of potential ramifications and implications from believing that concussion is not necessarily a brain injury. And that helps in the public discourse, as well as in the privacy of your own personal life and personal thoughts. And yet… over time, that distinction has worn thin in my mind. There’s something about using the word “Concussion” that doesn’t square with me. Which issue is going to get in my way today? To me and other former football players, things that occur normally in all people’s lives–like forgetting a name or where the car is parked, getting upset with a spouse, or having difficulty controlling an impulse — can feel similar to the startling sound, eerie shadow, or unexpected footprint foreshadowing a confrontation with the movie’s villain. This is absolutely consistent with the experiences of so many TBI survivors. Those little glitches that “everyone has” take on added significance, and that actually adds to the problem. Our senses are heightened, our stress levels, too, and with that comes a spiraling effect — problems which are troubling in and of themselves, become even moreso when you see them as tips of a field of icebergs lying in wait to sink your proverbial ship. It’s a vicious cycle, no doubt. And while the movie Concussion has raised awareness, I think it’s also had its drawbacks — namely, it’s a couple of hours of dire warnings, followed by a mad marketing blitz of “awareness raising” around all manner of advice, products, solutions, etc — many of which cost a fair amount of money, many of which are absolutely untested by anyone who’s even remotely independent. 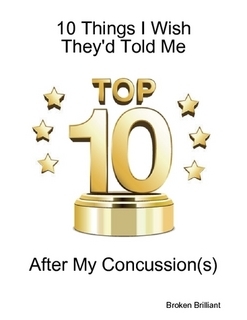 It’s the perfect storm for a whole new market — concussion prevention and awareness. And it’s got the perfect target audience: parents who are concerned for their kids’ safety and who will pay any amount of money to protect (or treat) their kids from concussion. While I do believe it’s so very important to raise awareness and educate, the whole “protection” business strikes me as just a bit mob-like. Think about the protection business in organized crime — it’s made clear to a store owner or someone who lives in a certain neighborhood that things are dangerous there, but for a fee, some designated individuals will protect you from that danger. Whether the danger is real or not (or existed before the protectors showed up), is debatable. But the fact of the matter is, once you pay your money and do so regularly, things get calmer and you can go back to your regular business. Marketing so often plays that same game — and some industries, too. Take, for example, the “flu drama” we experience every winter. When I was growing up, people got the flu. Sometimes, if they were weak or very old or very young, they got seriously ill. Some of the weakest, oldest, and youngest, did die. But it wasn’t portrayed as this plague-like threat that promises to sink Western Civilization and plunge our nation into bankrupted chaos. However, now that we have expensive flu medicines, along with flu shots (which are highly controversial), suddenly, there’s a FLU SEASON, and we’re continually inundated with flu med commercials, from the time of first frost, till Memorial Day. Making people afraid of being sick is really good for business. And making people afraid of getting hurt, is too. Especially when there are so many new products and services available to consume. Anyway, it’s been a challenging couple of days, so I’ll wrap up. I’ve had a lot of headaches, as well as trouble sleeping and keeping to a schedule. Fatigue, blurriness, mental fog… Being off my schedule for a week and a half, while refreshing, had its own set of challenges. And now I’m transitioning back into the flow. In the end, I think the discussions are helpful about concussion, and I am very happy that people are getting a clue about the issues that often come with repeat head trauma. It’s my hope that people will continue to discuss, rather than just getting freaked out, purchasing a product, and then expecting someone else to manage the risk for them. When we give up our autonomy and trust folks who are not trustworthy, that’s a recipe for trouble. Especially for the kids who are put in harm’s way. Woo hoo! More money to be made! Oh, Lordy — it’s all breaking loose. Now that Will Smith and his controversial accent have shed light on the dangers of concussion in pro football, the discussion about concussion is becoming very, very LOUD. While I’m glad that there’s more information getting out, a huge problem is that now — apparently — there is money to be made from concussion. Not only in terms of Hollywood, but in terms of all those panicked parents, coaches, school districts, athletic associations who will rush out and spend any amount of money on any product or service that promises to A) protect athletes from concussion, B) help them recover faster (so presumably they can get back in the game), or C) alleviate the long-term effects of post-concussive symptoms. Oh, and let’s not forget — D) keep them from getting sued. Sigh. Concussion / mild TBI has been around for eons — probably since the beginning of time. As long as there have been heads with brains… and gravity… and heavy objects overhead… and places to fall off… and people / animals / objects taking shots at your head, there has been mild traumatic brain injury. Concussion. But nobody’s paid much attention, over the years. At least, not till recently. And since the American public really gets its “most trusted” information from commercial sources, only now that there are products and services being hawked as “solutions” to this “epidemic”, only now are they starting to pay attention. Somehow, Americans don’t trust sources which are not profitable — with profit being our litmus test for validity — if it’s not profitable, it must not be any good, because people aren’t willing to pay money for it. And so, our society is plunged into yet another permutation of confusion and disinformation, spread by those who know exactly how to position their marketing and advertising “messages” to a frightened public. I don’t want to sound embittered or cynical, but maybe I am. I just can’t stand the way people are jumping all over this concussion issue and promising things they cannot possibly promise. Like football helmets that prevent concussions. Like mouthguards that prevent concussions. Like body armor that protects from concussion. Meanwhile, the folks who are getting hurt are just so much collateral damage. I’m sure all these new products have disclaimers that exempt them from legal liability if they fail to deliver on their promises. Nobody seems to get that concussion happens inside the skull, not on the outside, and if you are moving forward with incredible force, no amount of cushioning is going to halt the impact of a soft brain against the hard, bony, rough-edged inside of a skull. You just can’t protect the inside 100% with something on the outside. It’s common sense — IF you understand how concussion works, in the first place. But people don’t. They don’t want to think for themselves. They want an expert to tell them what to do. Because experts have convoluted the discussion so terribly, that everyone is just confused. Confused and scared and desperate, holding their credit cards at the ready. And the experts are often really just marketers who know how to present themselves as experts. Even “physicians” who pose as concussion experts are suspect — witness the Steelers’ “team concussion expert” who was a rheumatologist, not a neurologist. The saddest thing of all, to me, is how the concussion conversation has been so controlled and manipulated by the people who already have economic ties to concussion-producing activities. The NFL, NHL, and other leagues are culpable — and they’ve gotten away with all kinds of sh*t for many, many decades. But they’re serving a need, so those of us who want what they’re selling, will buy their version of the story. Gladly. It’s really, really easy to market things like football, boxing, and MMA to people who are stressed out from the demands of their daily lives, who are looking for a way to unwind, and who want to see someone else get beat up, for once. I know — I’m one of those people who loves to watch football… boxing… and MMA. I know what it does to people, but to my tired mind, they’re not getting beaten down any more than I am — and they stand a chance to make a whole lot more money than I do. So, I figure they’re taking their own lives in their hands. They’re adults. They can make up their own minds. But then again, if someone is brain-injured — as so many of these athletes are — is that even true? CAN they make up their own minds? That’s what we’re being told, and that’s what we want to believe. But again, that’s part of the conversation that’s being controlled by the people who make the money — and who stand to make even more … or lose a lot … depending on how the conversation goes. Officially, football is a way to make men out of boys. It teaches them teamwork, it teaches them to be part of a common goal. It teaches them to get knocked down and get up to keep fighting. It toughens them up, and it’s an integral part of becoming an American Man. As for boxing, we have the Rocky movies (including the last Creed movie), where the heroes bond and prove themselves in battle, becoming men (or better versions of the men they were) through taking a beating and coming back stronger. As for MMA, all I can tell you is, I find it very gratifying to see people just going after each other — like gladiators of old. Only now, the gladiators are killing each other a lot more slowly — which in the end is easier on the promoters of the sport. It’s expensive to keep finding new fighters. Keep recycling the old ones, and you can build a story-line around their ongoing battle to get to the top. Like so many things in this country, it’s really all about the money. It’s what drives us, it’s what sustains our systems, it’s what gives us motivation. I know there have been studies about how money is not the #1 motivator for people, but the people they surveyed weren’t at the very bottom or the very top of the economic food chain, so I don’t think much of those studies. It’s comfortable in the middle, where you never have to worry about where your next meal is coming from. For those without that safety, money is a big deal. And it’s a big deal for the people who have a lot of it. Because it’s awfully easy to lose it all, and end up cast out of your place in the world. It’s on either end of the spectrum, where the money matters most. But those in the middle — well, it seems all too often like they’re happy to not even think about the issues. They’d rather have someone else think it all through and provide them with a solution to problems they don’t want to try to understand. After all, that’s what they pay good money for. Tomorrow the movie Concussion hits the theaters. Ironically, I won’t be able to go, thanks to debilitating overload from the holiday season, as well as having heightened problems with sensory stimulation, these days. It’s touch-and-go with my energy, as well as my tolerance for crowds. All I can say is, thank heavens I got all my shopping done by 5:30 last night. Then again, I don’t feel as though I’m being 100% remiss in missing the movie on opening night. My entire life is pretty much run by concussion / mild TBI, and I’ve dedicated a big chunk of my life to not only successfully recovering from this nasty chronic condition, but also educating others about how they can do the same. It’s a daily vocation for me. It matters. And I started doing this back in 2008, so it’s not a new thing for me. The way I see it, if this movie raises awareness and gets people thinking about this issue in more realistic terms, then maybe tomorrow is a “day off” for me — somebody else is doing heavy lifting in raising awareness about head injuries. And it’s Hollywood, no less. There’s a ton of press coming out about this — and my local PBS station is airing the Frontline special, “League of Denial” in advance of the Concussion movie release. On the other hand, what kind of awareness are they raising? Is it the kind that puts people into a panic and sends them into crisis-mode? Is it the kind that raises the klaxon alarms of LAWSUIT! LAWSUIT! with school districts and colleges… that prompts parents to either refuse to let their kids play any more football, or plunge into a denial-driven heartfelt defense of football as a character-building exercise? Is it the kind that causes kids to think they’re going to lose their minds and die early, if they hit their heads? Is it yet one more public awareness campaign that further polarizes an already divided nation about our #1 most beloved sport? My problem with this kind of awareness-raising, is that it’s so dire – that works against it, in my opinion. It can look like just so much Hollywood sensationalism and propaganda that paints a dismal picture for effect, while it may not actually follow up with any sort of balanced alternative view about what you can realistically do. It might freak everyone out, but how is it reassuring parents, teachers, kids, and everyone else in the mix that while the situation is serious, it’s not the end of the world? It’s certainly the case that repeat head traumas in football (and other sports) can lead to a host of problematic issues, as well as CTE and premature death. It’s certainly the case that concussion — from any source — can lead to persistent physical, mental, functional, and behavioral problems . Most people recover, but some don’t. And not taking care of yourself after a concussion is a great way to help those symptoms persist. But HOW do you take care of yourself? How do you do the things that your body needs, in order to get back on your feet and get on with your life? Even before that, how do you understand what’s going on with you and figure out the steps to take to deal with your issues? How do you even figure out the issues that you do have? How do you explain things to friends and family? And when does it make sense to worry? All these are basic, fundamental questions that come up — and unfortunately there’s not a specific set of guidelines to follow. Even the cases where there are recommendations, they can conflict. And given the amount of new research that comes out regularly, it’s hard to keep up. The confounding problem with treating concussion is that you’re trying to serve a dynamic population with a wide variety of changing, very personal symptoms, whose needs may vary from case to case. Everyone’s situation is different, everyone’s treatment is a little different. And people need to follow through themselves — they can’t just take a pill or expect a doctor to sort it all out for them. How do you get enough information to people up front, so they take proper steps from the get-go… as well as understand what’s happening in their brain, so they’re not so frightened, disoriented, and intimidated? How indeed? Because it’s important that this happens. I believe that poor care from the very start lays the groundwork for future problems. Not giving your brain enough rest and letting all the chemicals settle down, is a great way to unsettle your system and add stress to an already stressed system. Not taking time away from exertion — even amping it up, because that’s what your brain is telling you to do as it tries to recover from the flood of biochemicals that are unleashed when a brain is injured… well, that’s an excellent way to prolong your recovery, even set it back. It’s also a great way to get injured again. And again. And again. Because your coordination can be off, at the same time your body is telling you to go-go-go. And meanwhile, the people around you don’t understand what’s going on with you, they may be entertained by your manic behavior, or they may be upset with you because you’re not up to doing the things you did before. Personal experiences after concussion are as many and as varied as personalities, themselves. So, small wonder, there’s no truly consistent way of managing concussions, just yet. I do think we will get there. But in the meantime, we’re being deluged with information about how life-threatening concussions are, how much they can mess with you, and how sinister the effects can be. It’s putting people on edge, there’s no doubt about it, and as a result, people are just … well, just plain scared. And/or they shut down the flow of information, because A) it’s too much for them to take, and B) they don’t know what to do about it. I could go on, but I’m going to break, right now. I’ve written a little eBook about What You Need To Know After A Concussion. It’s free. It’s basic, but it’s got exactly the things I wish I’d known, when I got hit in the head all those times. I’m working on an extended version (that will be a paid version), to support this work — and also provide more value to people who want more in-depth discussion. But for those who just want a high-level overview, just to get their bearings, the eBook (download it here) provides at least something. So, this Concussion movie really presents us with an opportunity to talk more about this issue in ways that are genuinely helpful. And I think it will fall to the community of concussion / TBI / ABI survivors to reassure a nervous populace that brain injury does NOT need to kill you, necessarily. Sometimes it does, sure. But it’s not a death sentence. Those of us who know better need to speak up — and I’m hoping that more of us will.